We started this process of more purposeful prayer for our children by consecrating them to Jesus, Mary, and Joseph. We talked about how consecrating them meant setting them apart for and in the service of God. Today let’s talk about consecrating ourselves–setting ourselves apart for and in the service of God. Have you ever heard the Latin word, “Serviam?” According to Wikipedia, “Serviam is Latin for “I will serve.” This was the cry of St. Michael the Archangel as a response to Lucifer’s “I will not serve” (Non serviam) when God put the angels to the test…It is also recommended as a morning prayer or morning offering.” And this is how we consecrate ourselves, we open our eyes and we say/pray, “Serviam” “I will serve.” You could even get down on your knees first thing in the morning and say “Serviam.” And I have heard stories of people who say “Serviam” and then kiss the ground first thing in the morning–motivation to keep the floors clean if you ask me. The point here of saying “Serviam,” whether you lie in bed, kneel down beside the bed or walk to the coffee pot, is to offer your first moment of the day to God in service. Our very first act of the day is to consecrate ourselves–set ourselves apart for and in the service of God. I believe this one simple word and practice of praying it as soon as we wake up will lead to a more fruitful morning prayer life. If our first act is prayer, how much easier for our second act? And not only our first act of the day, what about a “Serviam” before we eat our lunch, a recommitment to living the rest of our day in service to our Lord. 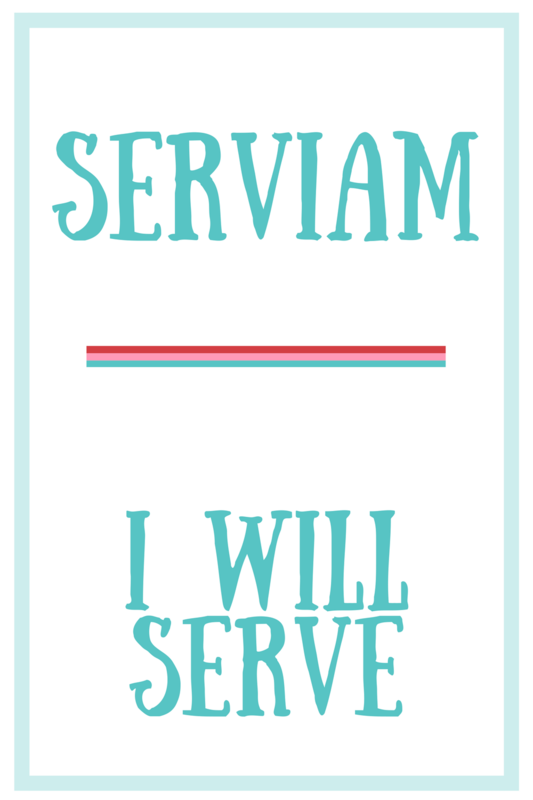 *If you’d like to wear a reminder, Melody at Blossoming Joy has “Serviam” tee shirts for order. I’ve had my eye on these for a while now–a great shirt, a worthy cause. I love that idea, Jenny! A truly wonderful way to begin my day. I know and so stinkin’ simple! After you mentioned Serviam at New Years to me, I set that as my wake up setting on my phone. It now shows….Serviam…so when I read the alarm before I snooze, I have read it and pray that So I have found if I snooze my alarm, I am effectively saying Serviam multiple times each morning!!! HaHa I love this Rebecca!